The Dian culture describes the remains of a wealthy Bronze Age society (late first millennium BCE) excavated in Yunnan, Southwest China. Tens of thousands of grave goods from hilltop cemeteries show that the material culture was that of Southeast Asia, but there are also signs of early interaction with China in the field of metallurgy. 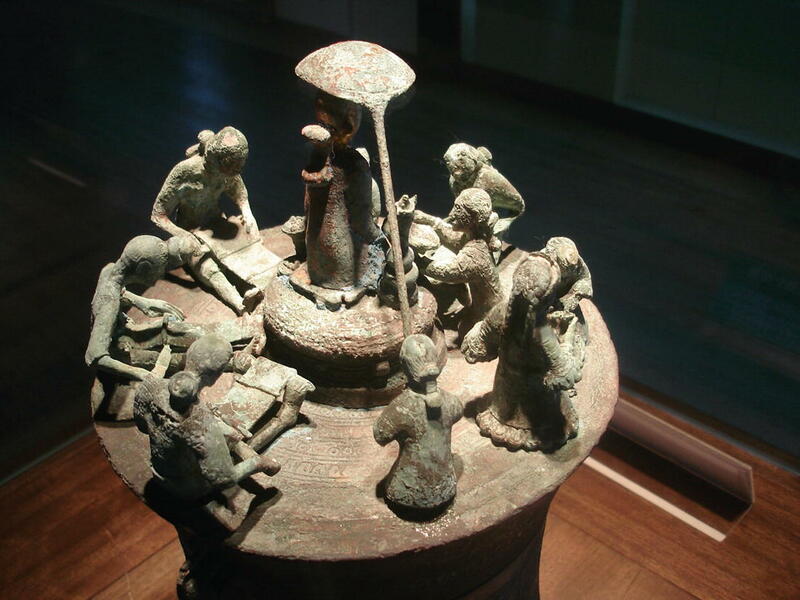 Dian was conquered by China’s Han Empire in 109 BCE, and the distinctiveness of its material culture diminished thereafter. The Dian culture consists of Bronze Age sites and artifacts excavated from burials in the high plain south of modern Kunming. In the absence of skeletal material, most studies are based upon the thousands of bronze artifacts. Their distinctive figural decoration gives important information about social hierarchy and gender relations, as well as about interaction between animals and human. Lake Dian is the northernmost and largest of a set of four lakes occupying a high plan, c.1900 m ASL. The plain extends from Kunming City about 250 km to the Red River Fault which forms the southern edge of the Yunnan-Guizhou Plateau. The Red River (Hong He or Yuan Jiang) drains to the Gulf of Tongking across the Tropic of Cancer. The levels of the various lakes have changed over time, so that the site of Lijiashan may even have been an island when used for burials (Lustig et al. 2011: 60). The Red River is navigable for most of its course. Its headwaters are not far from the modern city of Dali (Xiaguan) from which there is access to the Upper Yangzi (Jinsha Jiang) and through Sichuan province into Central China. From Dali it is also possible to reach the Mekong (Lancang Jiang) and the Shan Plateau of Myanmar. Despite its tropical location, the climate around Dian is relatively temperate. The upland plain is suitable for pasturing, and images of cattle and horses are common on the Dian bronzes. Sheep are also shown, as are pigs and dogs. There are many shell middens around the lakes, molluscs presumably being an important part of the diet, and there is evidence that millet, wheat, and rice were cultivated (Yao and Jiang 2012: 362). Around modern Gejiu and Mangzi, between the lakes and the Red River, are extensive deposits of minerals, particularly tin, but also copper, lead, and silver. 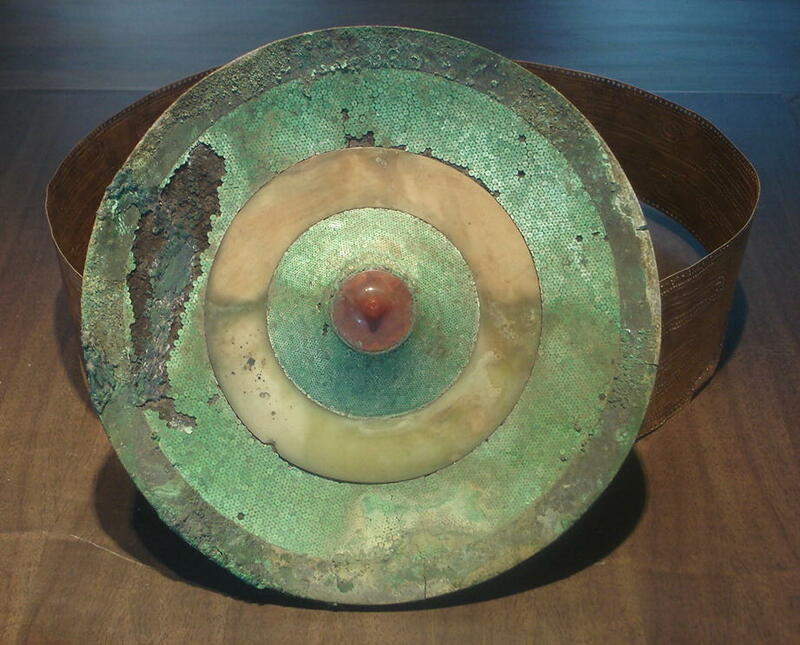 In 2015 parts of metal vessels were found in a huge shell midden at Xingyi, near Lake Qilu, dated c. 1400 BCE, and the site of Haimenkou gives dates for early bronzes by 1700 BCE (Li and Min 2014). These dates fit with the reported use of Yunnan copper in some of the bronzes deposited c. 1200 BCE in the tomb of Queen Fu Hao at Anyang, Henan, in Northeast China (Jiang 1999: 118). The quantities of bronzes found in the Dian graves, and the excellence of their workmanship indicates there was long experience of metal smelting and casting. The mineral deposits and their location were listed in Chinese geographical works of 2 CE and 140 CE (Crespigny 1996–97: 767). Yunnan was so difficult of access from Central China that it was basically ignored until the creation of the People’s Republic (PRC). Archaeological investigation then developed rapidly with many sites excavated since the 1950s. Between 1955 and 1960, the Yunnan Provincial Museum excavated 50 graves at Shizhaishan, which we now know to be the richest of the Dian cemeteries, dated at the time to third century BCE. In 1996, another 36 burials were excavated there, showing that the use of the cemetery dated back to the fifth century BCE. Numerous other burial sites have been excavated, but there is still a lack of information about settlement or metalworking sites. Most researchers outside China have concentrated on the societal aspects, inevitably based on grave goods and thus partial. There is a consensus that the Dian polities were hierarchical and strongly gendered and that elite women had a high status (Rode 2004; Lee 2002: 111–115; Yao 2005: 399–400). The acquisition of power has been discussed by Robert Murowchick who identifies warfare and slave raiding as its basis (Murowchick 2002: 159–164). A couple of paragraphs in the official history of the Han Empire, the Shiji by Sima Qian (writing between 109 and 94 BCE), explain how Dian came to the notice of Emperor Han Wudi, who was seeking a route to India. He invaded in 109 BCE, but because the local ruler sued for peace, he “was presented with the seals of the king of Dian and restored to the position of leader of the people” (Watson 1961: 258). The story is credible since the event occurred in Sima Qian’s lifetime and is supported by the presence of a gold stamp inscribed Dian wang zhi yin “Seal of the King of Dian” in tomb M6 of the major cemetery at Shizhaishan. The Han established a prefecture (commandery) and renamed the greater region Yizhou. Grave goods of the first century BCE to second century CE confirm an increasing Han presence (Allard 2015: 34). When the Han Empire collapsed, the region slipped out of China’s control and did not return to it until the Yuan (Mongol) conquest of the thirteenth century, when Yizhou was renamed Yunnan (“Below the clouds”). The Han had abandoned the India-road project – largely because of the creation of the Silk Roads through the Western Regions (modern Xinjiang) – but all available evidence indicates that there were strong and ongoing connections between Yunnan and Southern Asia (Yang 2008, Chapter 2). Connections to Myanmar/Assam are marked by the quarter of a million of cowrie shells, most likely from the Indian Ocean or Maldives, deposited as grave goods in 25 bronze containers, some mounted onto old drums modified into pedestals. Other items from the south or southwest are ornamental stones, jade, agate, and turquoise. A less well-known connection is the saddleback roof house which today survives only in Malaysia and Indonesia (Dumarçay 1981). Three are known from 3-D models in Shizhaishan (SZS). All are two-storey and supported on paired columns (Lee 2002: 117, 119). Archaeologically, Dian’s best-documented connections are up the Red River to modern Dali and beyond. Agricultural crops came this way (Stevens et al. 2016) and likely domesticated livestock from Central Asia: steppe ponies, realistically represented in bronzes from elite tombs, fat-tailed sheep, and longhorn cattle. Dian’s most obvious connection to the east is its great quantity of bronze drums, which were clearly an important part of life. They are thin-walled hollow vessels with a flat base (tympanum) which is the percussion surface. Widespread in Southeast Asia with concentrations in Yunnan, Northern Vietnam, and Southeast China (Guangxi-Guangdong), they were manufactured in Myanmar until the twentieth century. They have been studied for well over a century – the standard typology still being that established by Franz Heger from a sample of 153 drums (Heger 1902). The Dian drums are all of Heger Type I, the earliest and a most elaborately decorated; they were deposited as grave goods, sometimes adapted as cowrie containers, but also seen as miniatures, on ornaments and as part of three-dimensional narrative scenes (Bernet-Kampers 1986–87: 314–325). In one famous example, on SZS M12:26, 18 drums are shown on three sides of the raised platform of a communal hall where a ceremony is taking place; at ground-level double-height drums are placed on either side of a sacrifice-post. Near this post is a crossbar from which hang a large bell and another drum, both being played by the same musician (Lee 2002: 117; plan view in Yao 2005: 403). The drums have been compared to the well-known assemblage of over 200 drums from the Dong Son settlements around the Red River Delta of Northern Vietnam. Where comparisons can be made, it seems that any influences would have been downstream from Dian toward Dong Son (Murowchik 2002: 177). Reciprocal exchange is hard to determine, but it is worth considering that there were at Shizhaishan two copies in bronze of the famous West-Asian silver box found in Guangdong in the tomb of the king of Nan Yue, who died 122 BCE (Cremin 2010: 115). This object is an indicator of the Maritime Silk Road, which passed around South India, Thailand, and up the Vietnamese coast, carrying goods from the Mediterranean and Western Asia; the reciprocal traffic included potash glass made in Guangxi. Brigitte Borell (2012) has published an important find of such glass with Han period Chinese goods, but also seven Heger Type I drums in what is presumed to have been a burial at Lao Cai, Vietnam, on the Red River, 360 km from the China sea, but only 260 km from the Dian lakes. 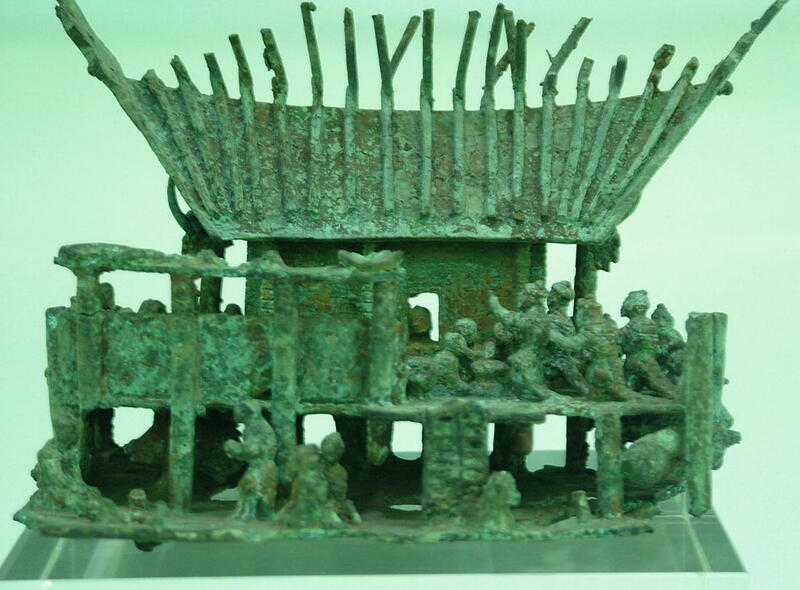 There are many connections with China’s central plains, and they may go back a long time, if Yunnan copper was indeed used in Fu Hao’s tomb; it’s worth noting that her tomb also contained over 6000 cowries and thus the use of cowrie containers as grave goods might well be borrowed from Shang or Zhou China (Li 2006: 18). Other Chinese elements include T-section disk bracelets and from Shizhaishan M6 a set of six chimes to be mounted on a stand of which only the feet remain. Chinese influences have also been detected in the art styles (Chiou-Peng 2008: 37–38). More significant is the use of lost wax (or lost lead) for casting the 3-D figurines and other items. Whereas images can be copied, a technical development of this sophistication requires a human interface, and artisans may have reached Dian during the troubled times of the Spring and Autumn or Warring States periods (771–221 BCE), though other scenarios are also possible (Barnard 1996–97). Whatever their ultimate origin, Dian piece-mold and lost-wax castings are technically accomplished and must reflect decades of practice (Murowchick 2002: 140–152). 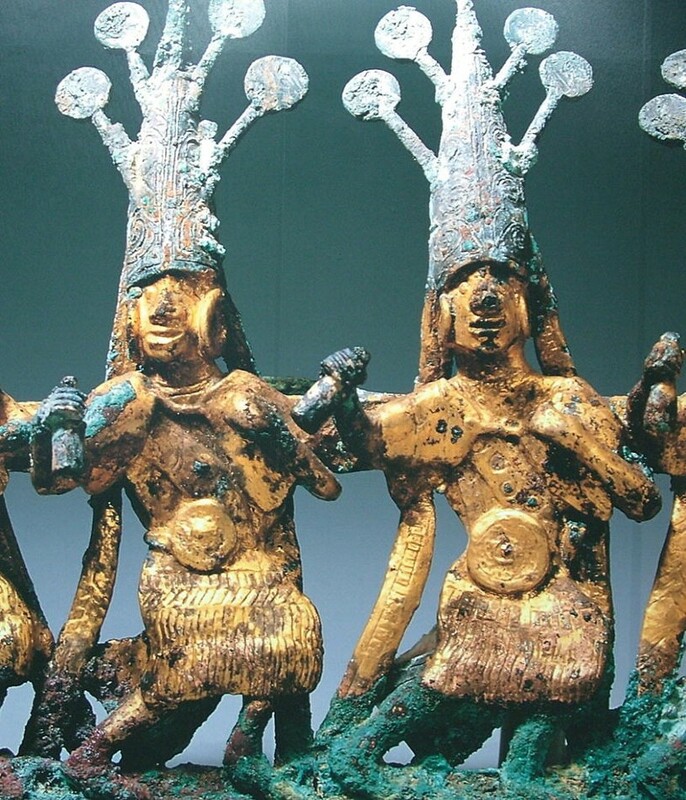 The Dian bronzes are justly renowned for their imagery, whether flat or in 3-D (Chiou-Peng 2008). They provide a wealth of information about the people’s life, such as music, weaving, ceremonies, and warfare all of which have been well studied (e.g., Murowchick 2002; Rode 2004; Cremin 2010). China’s archaeological heritage is on a huge scale, with major new discoveries every few years. Research and conservation measures are consequently vast in scope, and it is very difficult for non-Chinese reader to keep up with the stream of publications. In Yunnan matters are complicated by the relative dearth of information from the borderlands of Myanmar and Laos. Ongoing work on globalization and the role of the Maritime Silk Road will in time remedy this situation. The most important aspect of Dian research has got to be a better understanding of the settlement pattern. It is also important to understand how and where mining was carried out and to learn more about the source of the ornamental materials (jade, agate, malachite, turquoise) and their transformation processes. The frequent representations of interaction between human and animal, whether wild or domesticated, should be of particular interest to students of the Anthropocene, as they suggest multiple levels of interpretations from realism to myth. A greater knowledge of the paleoenvironment might help to address this topic (Figs. 1, 2, 3, and 4). Yang, B. 2008. Between winds and clouds: The making of Yunnan (Second century BCE – 20th century CE). Gutenberg-eBook. http://www.gutenberg-e.org/yang/index.html. Accessed 10 Nov 2018.